Sweet Shop Natalie: Who is this?? Halloween Giveaway! Who is this?? 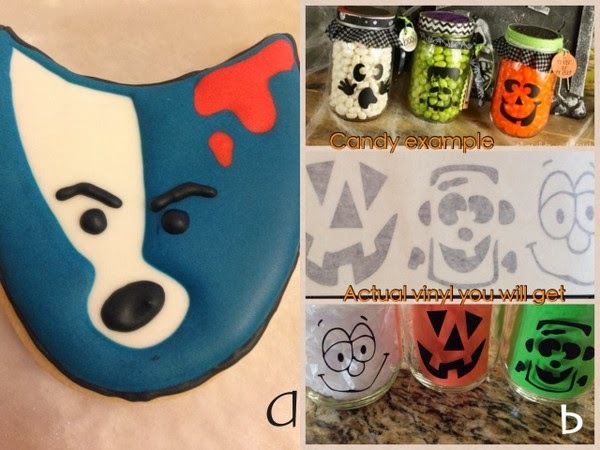 Halloween Giveaway! Want this set of cute vinyl Halloween faces!! Just leave a comment on this post telling me what the cookie in image A is representing. I thought it would be more clear when the design was in my head but I think it is not that obvious. Please leave your email address in the comment or I have no way to contact you if you are the winner. I will pick a winner at random tomorrow at Noon MST and as soon as winner confirms it the prize (picture in image B, vinyl only, does not include jars) will be shipped out in the mail. Mikhail Gorbachev? Horrible guess I know, but that was the first thing that came to mind lol. Heck I would love those! Too adorable!